This is basically a re-post from several months ago. But, we used this recipe last week in my Off Mendenhall Fall cooking class. This recipe is the perfect place to use your homemade preserved lemons – or you can just use lemon zest if you don’t have them. It’s really quick for a worknight but comforting for a Sunday Supper. Crispy Braised Chicken Thighs Recipe with Fennel, Olives and Lemon, (serves 2 to 4) Adapted from Ad Hoc at Home, full recipe available here. Preheat oven to 375F. Cut off the fennel stalks and discard the fronds. Trim off the bottom and cut the fennel in quarters. Core the fennel. Remove the layers of the fennel and chop into 1/2″ thin slices. Pat chicken dry and sprinkle with salt. Heat a large oven-proof skillet to medium high heat and add canola oil. Add thighs skin side down and cook until browned, about 5-10 minutes. Flip chicken and cook for another minute. 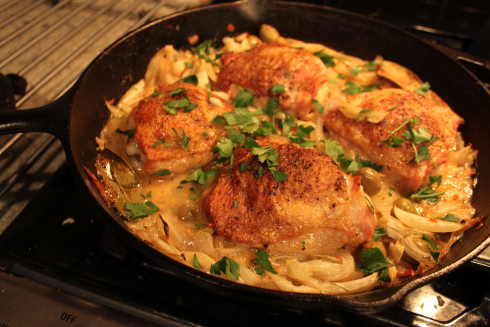 Remove chicken from the pan and set aside on a plate. Reduce heat to medium low and pour off excess oil, you only need a teaspoon. Add onion and saute for 1 minute. Add garlic and continue sweating, stirring regularly until onion is translucent, about 5 more minutes. Add fennel to the pan and turn heat back up to medium. Stirring frequently cook until fennel is tender but still has a bite. About 10-15 minutes. Add olive, red pepper flakes, thyme, bay leaf and zest and cook for 1 minute. Add wine and simmer for two minutes to reduce. Add chicken stock and bring to a simmer. Nestle chicken back into the pan so it is sitting on top of fennel skin side up, and just 1/4 submerged. Put pan in oven and back until chicken is cooked through 20-25 minutes. Give the chicken a baste with the juices, turn on the broiler, and while watching broil for an extra minute or two to get the skin extra crispy and browned. Remove thyme sprigs, stir in parsley and serve. Squeeze a little lemon juice over the top for a nice kick!